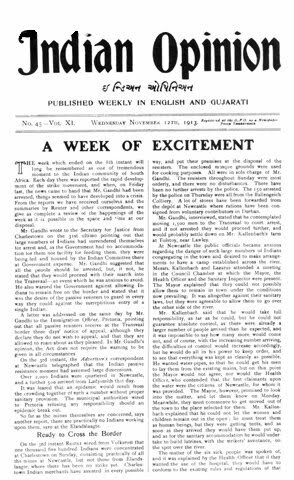 In 1889, the British led Government of India published an Amendment in the Indian Official Secrets Act of 1889, coinciding with Mahatma Gandhi’s own newspaper The Indian Opinion in South Africa. Though his contemporaries in India were facing various repressive measures under Press Acts, Gandhi was not, during his entire stay in South Africa, handicapped in running his paper. The great Russian pacifist, Leo Tolstoy’s letter to Gandhi – Letter to a Hindoo – was published in the Indian Opinion. It was reproduced in the journal Gujarat Patra of Nadiad, a town on Gujarat. A notice under the Indian Penal Code was served on the journal by the repressive Government of India. 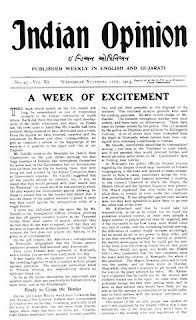 In the Gujarati edition of the Indian Opinion of 9 April 1910, Gandhi mentioned about this and said: “It is not a little surprising, though it does not contain a single sentence which can promote violence, the person who reproduced it is being prosecuted (echoes of Contempt of Court proceedings and fine and suspended prison sentence by Justice Hickie against Fiji Times and Netani Rika). 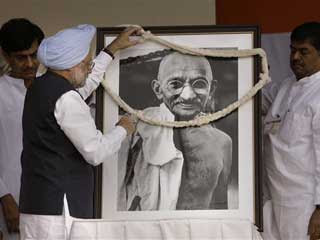 But Gandhi qualified his statement and said: “This raises a very important issue. If the principle we have laid down is correct, it follows that if any provocative writing has been published unintentionally and no apology is offered for the same, the newspaper will in consequence be prevented from rendering other services as well and the community will go without that benefit. We would not therefore, apply this principle to matter published unintentionally, but it should apply to what is published after full deliberation. He gave one obvious illustration: “Suppose that Government has committed a gross injustice and robbed the poor. A progressive newspaper is being published in such a place. It writes against the oppressive measure and advises people to disregard the unjust law of the Government. The Government takes offence and threatens confiscation of property if no apology is forthcoming. Should the reformer apologise? The Indian Opinion is not The Fiji Times - Mahatma Gandhi is not Rupert Murdoch - Fiji is not India - this is 2010 not 1889 - apart from that? Good story. @6:48pm...It is more than a story. Good stories are for entertainment. Ghandi was not an entertainer but a sage whose teachings transcend the bounds of space and time! Tyrants can also come in the form of a powerful media organization using its market share to subjugate and sabotage a nation's sovereignty by manipulating news in order to influence public opinion to achieve a hidden agenda. When a media organization such as the Fiji Times slanted its report directly abetting terrorist activities, they should be shut down and closed for good. Good riddance. Looks like Gandhi was too busy defending press freedom and not his nation, and the rest is history. The country was divided along religous lines and the situation there is as volatile as in 1947. Gandhi too busy defending press freedom to defend his nation? And so Joe, since you called 300,000 Methodists 'morons' in an earlier post on another blogsite, what is your interpretation of the thesis that India was divided along religious lines? Do we ban religion? Or shall we ban religious morons? (Perhaps that’s an oxymoron, depending on whether or not you’re an atheist). Trouble is, once religion is banned, society might develop a schism along the lines of politics, so let’s ban that too. Fiji society is already divided into the pro and anti Bainimarama camps so let’s ban those guys. Mind you, it might be easier to ban Bainimarama since he’s just one man. As far as the media goes, ban the lot of them since they’re only in it for the money. Which, come to think of it, is why we all work in the first place. Once we’ve banned the things that cause division in a nation, we’ll be left with men and women. Well ! We all know how differently they think and I’ve got no doubt that without the media, politics, religion or anything else giving a point of difference, that the nation will be divided down gender lines. The only solution I can see to this whole conundrum is that people should be banned. Altogether. Take Gandhi & Indians seriously when Brits start queing up outside Indian embassy's to lodge emmigration applications. No need to ban any religion. It has its place in society,but certainly not in politics. The mindset of the people has to be changed and the media was certainly no help because of the likes of yourself. When media organizations such as the Fiji Times misuse their role and threaten the security of a country with propaganda and abetting of terrorist activities such as witnessed in the last 22 years since coup 1987, and then collude with a racists masquerading as politicians in a political party, they need their license terminated and have their bosses thrown in jail. But when the media organization collude with corrupt and racist people masquerading as politicians to keep half the population in fear and deny them their basic human rights and freedoms, then they need a vigilant military force playing the role as guarantor of peace and security of the country to come in and clean all of them up. This is what happened in Fiji on 5th December 2006. Good to know that religion's ok with you, Joe. Politics too, but just not in the same sentence. So what happens when people's politics aren't the same? Do we ban the people? Or the politics? Or both? Or shall we just ban all the joe's that want to engage in mind control and let the people be? Oh I see, it not the military... it is all the fiji times' negativity that caused this. Perghaps they should have been more positiove about the sacking of the judicary, people being beaten to death, crusades by the illegaly appoitnment police chief, suspicously corrupt back pay to milary brass, miltary sackings of publice serice staff. How rude they should have put a 'positive spin' on all of this and more.Apparently everyone is corrupt except for the military. How amusing.